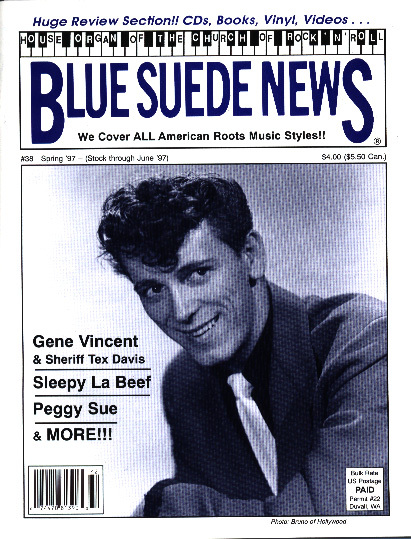 Blue Suede New #46: Gene Vincent, Sherriff Tex Davis, Sleepy LaBeef, Paul JOhnson, Belairs, Peggy Sue, Carnival Rock, Bob Luman, Rockabilly, Surf, '50s Rock'n'Roll! Issue #38 - Spring 1997 - Scroll down to order!! Blue Suede News #38 (Spring 1997) has 68 pages with a slick cover. It has Rockabilly master Gene Vincent on the cover and features an extensive interview with Sheriff Tex Davis, the man who discovered, managed and co-wrote songs for Gene. There is a story about another more obscure Rockabilly legend Sleepy LaBeef, a giant of a man with a repertoire of thousands of songs and lots of stamina on stage. Another story is about "All Weather" Paul Johnson, member of the Belairs instrumental Rock group of the early '60s about playing Surf music and more. Last but not least there is a very interesting interview with Peggy Sue, the inspiration for the famous Buddy Holly hit. And a movie review / comparison about Carnival Rock and other cool '50s and early '60s music flicks starring Bob Luman among others.